To go with the tour of the village, I've written another tour, this time of my garden and associated bits of hillside. I've posted this as a page, just in case you feel like referring to it when I'm talking about some bit of garden or other and you wonder where that is. Look to the right - there should be a link just there, A tour of the grounds, May 2011. I'm pinching this idea from Susie, who wrote a lovely post on the ordinary, day-to-day aspects of where she lives, which is Cambridge... except that when it comes to it, I'm not really pinching her idea at all. Her post is all about the non-touristy, boring bits of Cambridge. I started thinking about what I could say about where I live if I left the touristy bits out and frankly, I got a bit stuck. The thing is, whereas Cambridge has plenty of things that are not at all touristy, Devil's Bridge is built around tourism. This isn't a recent phenomenon - there was a grand estate that posh people used as a summer retreat, and the village developed from that. So here it is: The ordinary, everyday bits of living in Devil's Bridge, tourism included. I won't show you the bridge, though. So... Welcome to Devil's Bridge, or Croeso y Pontarfynach - take your pick. This really is a bilingual community and we're going to have to learn Welsh. We've encountered no hostility from the locals at all - quite the opposite, people here are very friendly and pride themselves on their lack of racism against the English - but the fact is that conversations go on in Welsh. For example, meetings are conducted in English (if English people are present - very generous of the locals, really), but as soon as people relax (which they tend to do quite readily), they slip into Welsh. Notice how the village name is spelt two different ways on the two signposts? I'm told this isn't random - there's a right and a wrong way to do this, depending on context. I can see that learning Welsh is going to be quite a major challenge. I'm not very good at languages in the first place. Another thing about the village name is that the English name isn't even a direct translation of the Welsh. In English we have the devil whereas in Welsh we have monks. My theory is that monks actually built the original bridge, but when the English arrived here, they were so amazed at this technical achievement that they said it wasn't possible that any mortal could have built such a bridge (even if he did have God on his side) - it had to be the work of the devil! So we have Devil's Bridge in English and Monk's Bridge in Welsh. From this I conclude that it would be unwise to underestimate Welsh monks. We have a community woodland, planted as a millenium project. Coed y bobol is my favourite Welsh phrase so far - Wood of the people - bobol/people - do you see the connection? I love spotting links between languages, even if I'm rubbish at learning to actually speak them. I think this woodland is a lovely idea, but it's also quite amusing, as it's tiny in comparison to the acres of woods all over the surrounding hillsides. The front of the tea rooms were given a lick of paint this spring, ahead of the tourist season, but the pub sign remains illegible under moss and algae. The buildings you can see in this picture are all connected, and are the remains of the country retreat - Hafod - that the village grew up around. It's now a hotel, but there's a strong community focus. They run events like regular quiz nights (which we've yet to go to - we need some friends so we can make up a team) and live music. It's a great pub, even if we can't understand half of what people are saying. We're very well catered for tea-rooms here. As well as the hotel, there's the station cafe and Y Caban. As you may have guessed from the picture, this is not a mainline station, but the terminus of a lovingly preserved steam railway. The railway line goes right past our house - railway empolyees even have right of access down our driveway to the railway line - and the train goes past four times a day (twice in each direction) during the summer, and eight times on busy days. 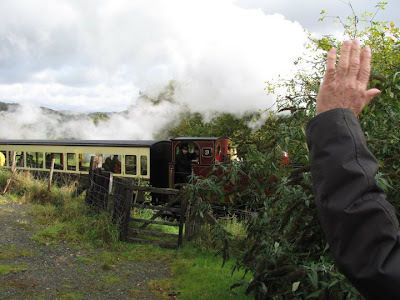 The train punctuates our days; we hear the whistle as it echoes around the valley - at one point we hear the echo before the original sound - and turn to look out of the window, or over the garden hedge, as the train goes by. The passengers are mostly looking at the view in the other direction, but sometimes they look our way, and sometimes we wave. Sadly, the train is no use at all as a means of transport. The first train of the day starts in Aberystwyth, so that's no use, and similarly the last one ends up there. We could catch the second train into town. It would take an hour to get there (vs. 20 min by car), then we'd have half an hour in town before we'd have to get the next train back again. It's not even long enough to buy fish and chips! Bus shelter, used mainly for displaying posters. We also have a bus shelter, but don't try to catch a bus from there. There is a bus that goes into town three times a week. If you want to catch it, you have to phone up the day before and let them know, and when it turns up, it's a car. Plane with propellers. I don't know what it is. Ian probably knows. Planes are quite a big feature of living here, too. We quite like these ones with the propellers. They're not too loud, they're quite cool, and they're slow enough to photograph. We're less keen on the military jets that weave in and out of the mountains, low enough that you wouldn't want to be in a double-decker bus when one flew over (that's if there were any buses round here). These are way too fast to catch on camera and are very, very loud. 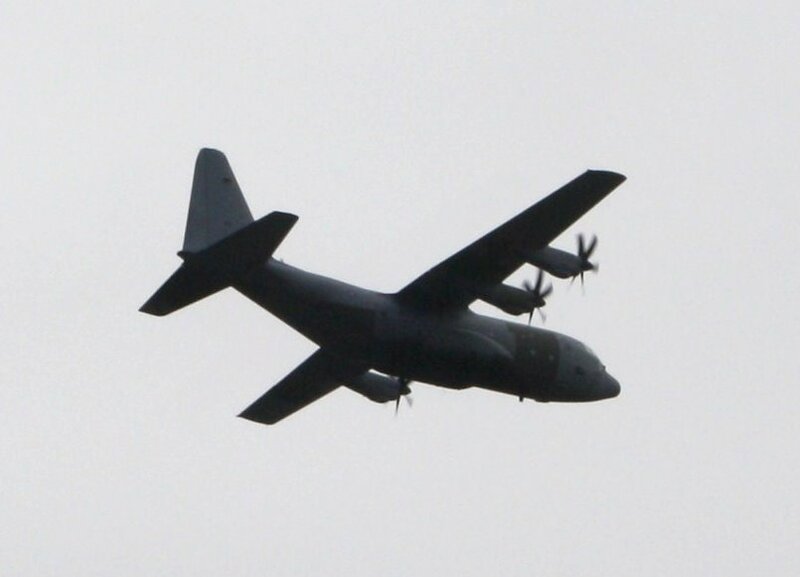 Every so often one goes directly overhead and so low that the noise is just overwhelming. I can understand why dogs don't like fireworks when those go over. I can't finish my tour of Devil's Bridge without mentioning the village shop. They don't actually do B&B. They did for a while, but stopped. The sign predates the current owners and their period of B&Bing. Maybe they'll have another go sometime in the future, and the sign will be true again. We go there frequently, usually just to buy milk, and we're on first name terms with the people who own it, and their daughter. They're very keen on supporting local producers, so they tend to have high-quality produce. Our neighbour who keeps bees down in the valley somewhere (too high for them up here) sells her honey there. The owners have chickens of their own and if they have a surplus of eggs, those will be for sale, too. If I have a glut of veg in the summer, I may try to sell some of it through the shop. The owners also tell us about local events they think we might be interested in. It's a proper hub of the community. *Not because my house is particularly picturesque, but because if you stand on a certain footbridge to take photos of the steam train, my house is in the background. Ian even found a picture of the house in a book on steam railways in an antique shop. Naturally, he had to buy the book. I've since learnt that a similar item is being sold on ebay which is a better shape, cheaper, and appears to be handmade. I wish I'd found that first! Anyway, this nifty little gadget means I don't have to heat up the oven just for one little pie as it can be cooked, albeit rather slowly, on the hob. The downside is that when the filling gets hot and boils, it tends to come out of the sides, which makes a terrible mess of the cooker! First, make pastry. I generally allow 2oz (bog standard white) flour per pie, but I often get some left over. For the fat, I use whatever meat fat I have in the fridge - usually lard - though I have to admit butter tastes better. Quantity is half as much butter as flour (i.e. 1oz per pie) though butter's not 100% fat, so if I'm using meat fat I use less; 3/4oz per pie. Rub the fat into the flour with your fingertips, then add water, very little at a time. I always use a knife and mix it in with a cutting action. I don't know why, but my mum taught me to do it this way. Add water until you get a soft dough, or until it's sticky, in which case you've added too much water (easily done), then you need to add a bit more flour until it looks about right. If I'm organised enough, I leave the pastry to rest in the fridge for a bit before rolling it out. Now, the bit you really wanted to know about was the filling, wasn't it? There are two ingredients here: cheese and wild greens. I've tried several variations on this, with different degrees of success. In the first version, the greens were entirely ground elder because that's all that was in season at the time, and the cheese was local, fresh (i.e. young) goats cheese that I'd bought, expensively, at the farmers' market. The cheese was light and lemony and the result was delicious. For the second version (the rolls pictured in the previous post), I tried to buy a similar cheese again, and got something from the supermarket labelled, Welsh soft cheese , which turned out to be more like brie. There was a greater mixture of greens this time, though I had trouble getting ground elder. Ironically, as the leaves grow bigger, it's harder to harvest, because the youngest, tenderest leaves get hidden amongst the older, tougher ones. This mix was about half nettle, and quite a high proportion of sorrel, to make up for the lack of citrus flavour in the cheese. I also included what ground elder I could find (not very much), some chives and Welsh onion leaves (essentially the same thing) and a few leaves of sweet rocket, which is not the same thing as salad rocket, but is also edible and has a strong flavour. That mix was also delicious. The third version, yesterday, used a similar mix of leaves but cream cheese - one Philadelphia mini tub - and that wasn't so good. The quality of the cheese is evidently important here. Quantities: You really need a lot of greens, as they squash down a lot when they're cooked. I gathered a large colander full for the little rolls, and I think it was the same for two pies the first time I made them. Yesterday I didn't gather quite so much, and only had enough for one pie. The cheese should be just enough to stick this together. I used half of one of those litte rounds, which I think is 50g, for two pies/five rolls. Pie filling on pastry, prior to rolling up, trimming off excess pastry, and cutting into pieces. Ian's going away for three days, so I'm cooking for just me for a bit. This gives me more freedom, because I don't have to take account of his tastes, but it's also more difficult because I can't just fall back on the usual repertoire. It's not worth baking bread just for me, so I need to plan lunches, too. Therefore, I've been forced to think, and I'm writing down what I've thought so I don't forget it. Lunch: cheese and carrot croquettes - this is Grandma's recipe, hence the poncy name (they're burgers!) It involves breadcrumbs, of which I have rather a lot at the moment. I may need some more cheese, though. Dinner: wild green pies - that's pies with filling made from wild greens, though I quite like the other interpretation! The greens in question will be mostly nettles, but also ground elder and sorrel, and they'll be held together with some cream cheese. Lunch: pak choi with garlic and cream - I have some pak choi in the fridge that needs eating up. I've seen a method for making cream from butter and milk, which I'm intrigued by, so this is an experiment to see if it works. Could be useful as the local shop doesn't sell cream. Dinner: beans in onion and tomato sauce, with couscous - this'll be the last of the borlotti beans that were 'too beany' for Ian. I mustn't forget to soak them the night before. Lunch: omelette, probably with chives, or leaves of Welsh onions, which I now have in the garden. Dinner: pasta and pesto - the basil's too small to use at the moment, but sorrel would be nice, as would wild garlic if I can find any. A previous incarnation of wild green pies, made as rolls because I didn't want so much pastry that time. Then I had lots of pastry left over, so I made cheese straws as well. They were very nice. When I was making oak leaf wine, I noticed that the syrup I started with was rather tasty. I've been planning to make cordial this year - I did want to make rhubarb, but ours is looking a bit pathetic so I'm leaving it alone - and this seemed like a good place to start. I picked another basket of leaves - actually slightly more than the first batch, about ten pints unsquashed - and put them in the jamming kettle. I added a couple of kettlefuls of hot water, which wasn't enough to cover the leaves, but I wanted to make this as concentrated as possible. I then boiled and left it to simmer for an hour or so. Actually, I didn't leave it at all, but did other things in the kitchen and poked it from time to time, trying to damage the leaves so more flavour would escape. At the end of that I fished the leaves out and put them on the compost heap. I tasted a few drops of the liquid at this stage - Eeeeuch! That'd take the enamel of your teeth! I think I have plenty of flavour in there, then. I overcame my reluctance to add any more bought ingredients than absolutely necessary (and any more acid), and added the juice of one small lemon. The result was pretty good, I have to say. I'm not sure whether it will keep. I did think of putting cordial in small plastic bottles in the freezer (and might yet do that) but this is very acidic and has a lot of sugar, both of which should deter mould. I'll take a chance and put it in glass bottles, no freezing. Oak leaf cordial. One of these days I'll start labelling things. I'll definitely be making more of this, though I may freeze the next batch rather than gambling the whole lot. Update 28th May: This doesn't contain enough acid/sugar to store well. When I opened the big bottle today I heard a faint hiss. The flavour wasn't much affected, but the hiss means it has started fermenting. I used this bottle to top up the demijohns of oak leaf wine, which have very active populations of wine yeast right now, so that should overwhelm any unwelcome bugs in there. That should also increase the strength of the wine a fair bit, too. I'll definitely have to freeze any more codial I make, and probably keep it in the fridge once open, too. Something was eating my sunflower seedlings. Monster slug hiding out amongst the toilet roll pots in which sweet pea seeds are planted. I'm too squeamish to touch a slug, never mind squish it (though I can cope with touching a worm, now) so I carried the cardboard pot to the driveway and used a trowel to flick the slug off there. Hopefully a bird or hedgehog will find it and enjoy the meal. I was getting ready to (read: vaguely thinking about) replace the eaten seedlings with new seeds, when I noticed they're still growing - look! Ghoulish headless seedlings, still relentlessly pushing upwards. These plant really are amazing! "Fail cake is still cake"
I once took objection to being called a perfectionist by a colleague. She was quite surprised because she'd meant it as a compliment, but to me, a perfectionist is a neurotic person (I was married to one once; I have rather strong feelings on the subject). When working on something, there are essentially two approaches to deciding when to stop: Either aim for the best we can do (optimising) or aim for good enough (satisficing). The trouble with optimising - and this is especially true for highly able people - is that one's idea of The best I can do may be a very high standard indeed, so high that in practice it's unattainable - The best is the enemy of the good. * This is why I don't like being called a perfectionist; I see myself firmly as a satisficer - able to recognise good enough and so finish that task and happily move on. The thing is, my idea of good enough is very variable, depending on the task in hand. At work, my standards have always been very high. I simply don't care that everyone else working in my field is happy to do it that way - if I can see a mistake, I will work to correct it (and then persuade everyone else...) A new boss was once concerned about the amount of time I was spending on a consultancy project. I explained about the lengthy calculations that I hadn't forseen at the start of the project, but once spotted, needed doing. And people would notice if it was wrong and we'd look bad? he asked. No, I replied, No-one would notice, but we'd be saying something that isn't true. On the other hand, when it comes to the domestic arts I really don't feel these high standards are necessary. 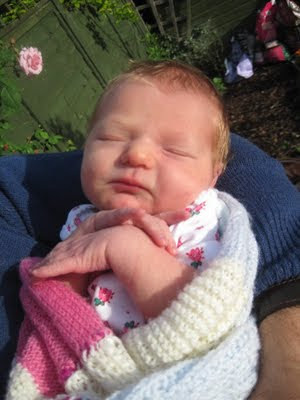 When I made a baby blanket for my sister, I gave it to her even though it was wonky, and she was pleased with it. When it comes to cooking, it doesn't matter if things don't come out quite the way I intended, so long as they're edible. I tried icing cupcakes the other day, and it wasn't a great success. I put too much water in the icing so it was very runny. The cakes were also rather small because I'd forgotten to put baking powder in (I was surprised that made so little difference). *I had to look up who said this. Apparently it was Voltaire. Very wise, that Voltaire. **I didn't have to look up who said this as I was there at the time. It was my husband. He can also be very wise. One of the things on my list of wines to try is oak leaves. We have a rather magnificent oak tree right at the top of the garden as well as a couple of stumps that have put out lots of shoots and leaves. John Seymour says that, In their first flush of spring growth the leaves of the mighty oak tree provide the raw material for a very fine country wine. However, he doesn't include a recipe, so I looked for one online. I was puzzled that the recipe I found (in several places) includes oranges and lemons. Oak leaves are highly acidic* when fresh (tannic acid, the same as in tea), so why bother adding citrus fruit? I decided to ignore the recipe and guess. First, I gathered a fair quantity of oak leaves. I was aiming for a gallon, but when I put them in the jamming kettle they came up to the six pint mark, or four pints when pressed down. Oh well, never mind. I'm never sure, anyway, when a recipe says a gallon of leaves or flowers, whether that's with the stalks on or not. These leaves would have taken up a lot more space if I'd left the stalks on. Oak leaves are pretty tough, so the next step was to boil them for a while to help extract the flavour, hence the jamming kettle. I can't remember how long I simmered for - probably about an hour. After that I put the hot liquid, complete with leaves, in the sterilised fermenting bucket, added a bag of sugar** and topped up to eight litres, or however much it is that the bucket holds. When it had all cooled down to a temperature unlikely to kill yeast, I added a couple of teaspoons of wine yeast, as per instructions on pot. I could probably get away with less than that - I'll try less next time. I gave it a few days in the bucket, then strained it into demijohns. Yes, actual demijohns - I'm moving up in the world of home-brew! Actually, I'm skipping a bit here. The demijohns were obtained via freecycle, and when we collected them the giver said, You'll have to give them a good scrub and sterilise them before you use them. Well yes, of course, I thought. It was only when I tried cleaning them that I discovered this is easier said than done. How do you clean out a huge bottle that is way too huge for the bottle brush? This is how. You - well, I - tie something to the bottle brush so as not to lose it in the bottle, then poke it in, followed shortly by a wooden spoon handle which is inserted into the little loop on the brush handle. Viola! One bottle brush with extended handle. No, it wasn't really quite like that, but it kind of worked. Oak leaf wine in demijohns with actual airlocks instead of balloons! Thanks to some advice on the 'ish forum I boiled the rubber bungs before using them (thanks to the bottles being different sizes, I first applied a sharp knife to trim one of them down a bit) and have put the demijohns in the kitchen rather than the conservatory. Apparently fermenting at high temperatures produces some of the heavier alcohols (propanol and butanol) that give you hangovers. I also learnt that beer is photosensitive, so light can produce some peculiar flavours. *For this reason, many people avoid using leaf mould made from oak leaves on alkaline-preferring plants. Apparently this caution is unnecessary, as the mould becomes less acid as the leaves decompose. This is good news for me, as the soil here is fairly acid already, and I wouldn't like to make it worse by adding oak leaf mould, which is an otherwise excellent compost. **I've been using one kilo of sugar per bucket since the first wine I made, which was elderflower. Elderflower champagne is fairly low in alcohol, but I thought that was because not all the sugar was fermented by the time you drink it (I'm not sure whether this is even true or not generally - it was true for mine). Now I know that this quantity of sugar is never going to produce a very strong wine. This is fine by me. I'm making wine because I like drinking it, not because I want to get plastered every time I have a few glasses. I'll stick with one kilo to the bucket. For dinner yesterday, we had pork chops with mashed potatoes and asparagus (for me; Ian had baked beans). I saved the water that I cooked the potatoes in, and used that to rinse the griddle pan that I cooked the chops in, putting the whole lot in a small saucepan. When we'd finished dinner, I put the bones and leftover bits from the chops into that pan and boiled it up, leaving it to simmer for the rest of the evening to make stock, straining it before I went to bed. I also saved the tough (well, relatively) bits from the bottoms of the asparagus spears, and we had a bit of mashed potato left over because I'd cooked too much. Recipes are all very well, but good food can be made by applying general cookery ideas to whatever ingredients come to hand. For the last month or so, people who like this sort of thing have been enthusing about wild garlic. I'd had a cursory look for some on the bank down by the stream, as that's the ideal environment for it, but didn't find any there. The this weekend there was a woodland fair in the village, and one girl was selling food made from wild ingredients. I asked her if she harvested her garlic locally. She wasn't local herself, but she'd heard that there's garlic by the railway line. Ah. That'll be the railway that runs right past my garden. I should really have another look, shouldn't I? The stallholder at the fair also included sorrel in her recipes, and I'd spotted some of that in the garden last year, so on my way out to look for garlic this afernoon, I made a small detour up the garden steps (as if we had only one flight of steps in our garden!) to relocate the sorrel. I found it! Sorrel, in amongst grass and moss. Formerly unidentified plant in a flower bed, now identified as sorrel. I first found these plants when I was digging over the vegetable beds. I asked my neighbour if she knew what they were and she said, Yes, they're hesperis, they have scented white flowers. On another occasion I pointed out the sweet rocket in a different part of the garden, and she said that this is the same plant - hesperis is the latin name for sweet rocket. I was pretty sure they were different - I know sweet rocket (flowering now - beautiful scent) and the other plant has smaller leaves. I'd left them a while to see what they might become, but was just getting round to the idea that they're nothing interesting. Now I've recognised them as sorrel, they're saved from the compost heap (though I've also spotted plenty elsewhere). It's funny how my plant knowledge comes and goes. I recognised sorrel easily in its usual habitat, but not in a cultivated bed, especially not when a friend had misidentified as something else. Anyway, back to the garlic. I walked along the railway line (no trains today), looking for the distinctive white flowers, which should be out at this time of year. I didn't see any, but it was lovely to be out looking at wild flowers, even though it's a drisly, misty, 'orrible day today. Then I caught a whiff... faint, but definitely garlic. I slowed down, examined the bank on my left more carefully. The bank on the right fell away steeply. I could have got down there, but probably a lot more quickly than I'd have liked! I walked on a bit until I couldn't smell the garlic any more, then came back and looked again. The smell was definitely there, but I couln't see anything that looked like wild garlic. Eventually I gave up and came home to dry off. This was encouraging and frustrating at the same time. I now know there's definitely some there somewhere, but I can't find it! I'll try again on a dryer day - perhaps in the woodland above that bank. I've no idea whether I'll be able to find the place again from the other side of the fence, but hopefully I'll be guided by the smell. Of course, it's possible that other foragers have been there before me, and all that's left is a few broken stalks (which would go against the ethos of foraging - you should never take more than half of what's there; in fact most people say don't take more than a third). Oh, well. At least I found the sorrel. We have a large comfrey plant in the garden (I'm not sure there's any other kind) which apparently is good for making plant food, especially for tomatoes. I recently discovered that humans can eat it too, so I decided to have a go at making comfrey fritters. It's pretty simple - you pick leaves, dip them in batter, and fry them. I didn't have any eggs, but I'd heard that vegan pancakes can be made with beer, and I did have a bucketful of half-brewed beer. I had them for lunch again yesterday and felt fine afterwards, so it was probably nothing to do with the comfrey the previous time. OK, 22p isn't a lot, but it's more than twice as much as the bread and butter that Ian had for lunch at the same time. So... quite a fiddle to cook (and frying sets off the smoke alarm), OK but not particularly exciting flavour, and cheap, but not as cheap as what I'd usually have. I'm not sure I'll bother with these very often, though I'll probably have them occasionally. *This is my judgement. If you want to try them for yourself, you should look up what people say about the risks and benefits and make your own decision. Or you can follow my example if you like, but that's still your decision not mine. A hay box is not necessarily a box of hay, though it might be. It's a box to put food in that's so well insulated that hot food will continue cooking with no additional input of heat. Not all types of cooking will work here, only slow cooking, the kind for which my oven has an 'S' setting, and which I use for cooking stews and beans. Over on Selfsufficientish, Nev had posted an article on making a hay box cooker from an old cool box and some polystyrene. I had an old cool box - it used to have a mini fridge unit in the lid, but that broke in a car accident and we bought another one - so that seemed a good place to start. I'd already replaced the broken fridge unit with bubble wrap, so the lid was as well insulated as the rest of it. I also had various bits of polystyrene lying around. Yes, my house is untidy enough that I can find useful quantities of polystyrene just lying around . Having found the insulation part, I then needed a cooking pot to actually put the food in. I was planning to try stew, so I'd usually cook this in a pyrex casserole dish (or my lovely Le Creuset dish if I'm making enough for six. Sadly, this doesn't happen very often). The trouble with my pyrex dishes is that whilst I have two dishes and two lids, neither of the lids fit either of the dishes. I have to cover the dish with foil when I'm cooking in the oven, which isn't any good for the hay box (or very eco-friendly in general). Oh yes! I thought, I've got one of those! Actually I've got two, but the smaller one hasn't got a lid. 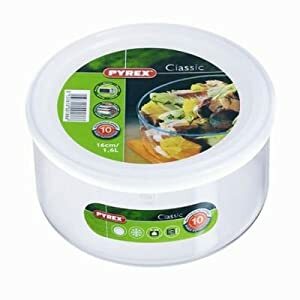 I didn't think of this for a casserole because the lids are no good in the oven (this is why my smaller dish doesn't have a lid), but it would be ideal for the hay box. With all the pieces collected, I then had to fit them together somehow. Unlike Nev, I did not purchase the appropriate tool for cutting polystyrene and carefully cut the pieces into the right shapes. Oh no, I just cobbled together what I had. As it happened, I had two pieces that both surrounded the pot and fitted into the cool box pretty well. I then found and cut more bits of polystyrene to fill the gaps, so I'd have a polystyrene base and various bits over the top as well. The last of these was a bag of wood shavings that had come as packaging for bulbs (plants, not lights), that would fit into the awkward shape at the top. Pot sitting on bits of polystyrene in the box, and more bits to go on top, including a bag of wood shavings. Again failing to follow Nev's good example, I went straight for cooking, rather than testing this out with water first. I prepared my stew, put it in the box and closed the lid at about 11:30 this morning. Come dinner time... um, that's seven hours later, not eight to twelve as recommended... I opened up the box to see what had happened. Well, it was still warm. Not hot - I could comfortably take the pot out without oven gloves - but definitely warm. When I checked the food, there had been some cooking going on. The meat and carrots were all cooked through, but you wouldn't say the meat had been stewed. It was still pretty tough. Oops. I hadn't really left enough time to stew it properly after that. I rescued our dinner as best I could by heating the stew up to boiling again in a pan - I'm not sure it's a good idea to eat meat that's been sitting around all day warm , even if it was in a sealed pot - and put it in the oven on a medium heat while I cooked the potatoes. The meat was still rather chewy. The hay box experiment wasn't a great success, but I can't say it was a total failure either, as the food did cook, just not very well. I'm guessing the problem was the air gaps in my insulation. I reasoned that since my cool box was better insulated than Nev's to start with, I wouldn't need to be so fussy with the additional insulation. And I was lazy. Also, the food didn't entirely fill the cooking pot, which isn't ideal - that made another air gap, and one right next to the food, there in the pot. I may give this another go at some point in the future. Who knows, I might even test it before using it next time! ... I didn't expect to find mushrooms growing in there! Here's a wider shot, to give you a better view of the floor it was growing in. It's more cave than room down there, if I'm honest. Now, what's the appropriate reaction to finding a large mushroom growing in the middle of the floor? Get rid of it as quickly as possible? Or try to find out whether it's good to eat? I took a couple of pictures of the other side of it, showing where the cap joins the stem. Mushroom, with the light behind it. Moody, but not very clear. Consulting various books and websites, I think it looks a lot like a morel. If that's what it is, it's considered a great delicacy. On the other hand, there's such a thing as a false morel which is poisonous, potentially deadly. The reason for getting a look from this side is to see where the cap joins the stem - if it's connected there, as it seems to be, that's a sign it's the real thing. Other clues to look for include what trees are growing nearby. Now it's one thing to have mushrooms growing downstairs, but trees would be another story altogether! I wasn't sure whether to post this here, because it's totally outside the scope of this blog, but we don't get a referendum very often, so what the hell! The No campaign made this up. Most of their 'cost' is for vote counting machines. There's no reason why AV should need machines - humans are far better at reading numbers on a bit of paper than machines are. Another big chunk of money was for the referendum itself, and we're not going to get that money back by voting No. Another way of answering this is to say, "Isn't democracy worth paying for?" Arguing against a fairer voting system on the grounds of cost is a slippery slope to set out on. Perhaps we should abandon voting altogether - that would be cheaper! 2. It's hard to predict what effect your vote will have. As opposed to the current system where anyone living in a safe seat (e.g. me for the last three elections, and those were three different safe Tory seats) can be pretty sure that their vote will have no effect whatsoever. Oh, come on! How hard is it to rank your favourite candidates in order? Or the ones who are standing from least bad to worst? If your first choice has no chance of winning, then your second choice counts, and so on. That is all. But you don't really think it's complicated, do you? That's just another myth put around by the No campaign. 4. We'd rather have Proportional Representation. Well yes, but that's not the choice we're being offered. The gamble here is which outcome is more likely to give us another chance to vote on a change in the electoral system. On the one hand, we get AV and the politicians say, "Right, that's that then, we're not going through that upheavel again" and we're stuck with AV. On the other hand, we keep First Past the Post and the politicians say, "Clearly there's no public appetite to change the voting system" and we're stuck with FPTP. Personally, I think we're more likely to get further change in the future if we vote for change now, but that's just a guess. Either way, I'd rather be stuck with AV than stuck with FPTP. I don't think AV is a particularly good system, just better than FPTP, and that's the question we're being asked tomorrow. Meanwhile, at the same time as voting in a referendum on AV vs. FPTP, here in Wales we get to vote for our representatives in the Assembly using PR! Yes, really! A partial, complicated version of PR, but PR nonetheless. Seems a bit ironic, somehow. I went to make a cup of dandelion tea last night, and found that all my dried dandelions have gone mouldy! Mouldy dandelions. Not just one or two - the whole tinful. Evidently in my haste to store as many as possible, I didn't dry some of them as thoroughly as I should have done. There are still a few flowers out now, so I can start again, but I don't think I'll get so many now. There certainly was a brick arched fireplace here - exactly what I was hoping to discover. Shame there's so little of it left. The discovery of the arch, as well as adding its own complications, raised doubts about the function of the wooden beam above. We'd assumed it was a lintel originally, but a visiting brother-in-law, who knows a lot about buildings, said it might be a thin strip for fixing things to. Apparently these were quite common in posh houses, for fixing wood panelling to. Now, our house is by no means posh, but it was industrial, so might have had just as much need for fixing things to the wall. That was the status for quite a long time. Hmmm. 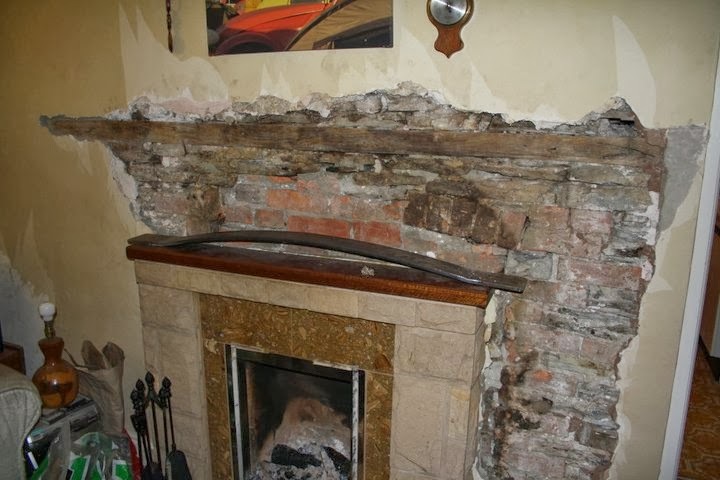 In due course we decided that we'd like to recreate the arch, retaining the rather crumbly sides of the original fireplace. The first step would be to get something to hold the arch up - and not just during the process of putting the bricks back. The original construction clearly hadn't lasted, so we'd like to have something a bit stronger for the replacement. A good sturdy bit of metal would do the job nicely. Firstly, I made a template of the shape we needed. This involved taking rubbings of the old bricks. Did you do that at school? With crayons? I didn't have any crayons, so I had to make do with pencil. The end result was a cardboard template with a rough outline of the shape, but more importantly, the key dimensions. Well, one key dimension - the width. We then needed to take this to a blacksmith. By happy coincidence, my dad's a blacksmith. Less happily, he's in France and his machine for rolling pieces of metal into arch shapes is in pieces. Otherwise, he'd have certainly made it for us. Yellow pages turned up several likely metalworkers, so I tried the nearest one, about five miles away along tiny back roads over the mountains. First I drove over there (slowly!) and found a promising looking workshop with a sign (and heaps of metal) that looked just like my dad's, but no sign of the smith. Over the next week or so I phoned several times, and got 'call waiting' every time. If this man spends so long on the phone, you have to wonder how he ever makes any metalwork! Ian made some enquiries of the builder next door (quite handy having a building site next door, even if it isn't very peaceful) and learnt that the blacksmith had recently died. That'll be why he wasn't answering his phone, then. The builder also recommended another smith, who'd been apprenticed to the deceased and had a workshop not much further away. 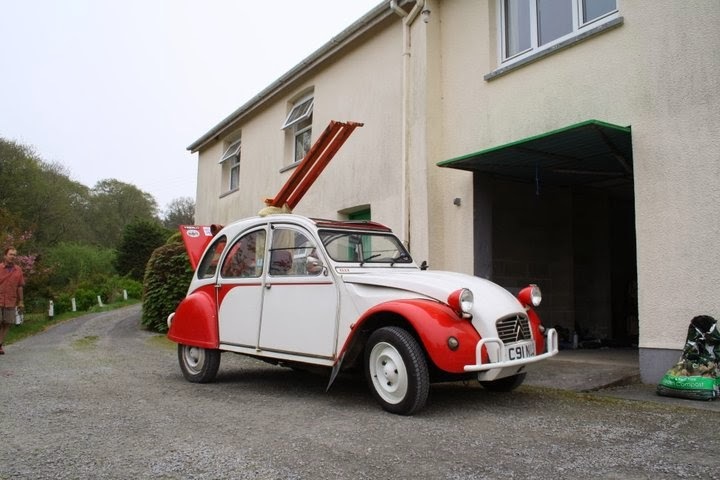 This time we called first, then went round with the bit of cardboard, and within two days we had our metal arch, in exchange for the princely sum of 27 quid. Not bad, eh? ... and there it sat for some considerable time while we pondered how to get it into the wall. It's all very well knowing what we want to achieve, but getting there was another matter entirely. Presumably there was something holding up the broken remains of the arch at the moment? If we wanted to get the metal arch into its rightful place, would we need to remove whatever it was that was doing the holding up? If so, and the lintel actually turned out to be a thin fixing-batten, would the wall fall down? Chimneys tend to be quite important features of houses, structurally speaking. Would the whole house fall down? Our dithering was brought to a head by the intervention of helpful relatives. Ian's aunt and her partner offered to come and stay for a few days to help us with the project. I could cope with potentially bringing my house down, provided I had someone more experienced there to share the responsibility! They came to stay for a few days before Easter. The first thing we did was to examine the lintel/fixing batten and establish that it was in fact quite deep and therefore almost certainly a lintel, not just a bit of wood for fixing things to. That made life a lot less scary. If things did fall down, it would only be a few courses of bricks and stone, not the whole house. Phew! Yippee! The horrid old fireplace is gone! There was indeed a lintel lower down, holding up the broken brick arch, so we propped that up while we removed bricks and stuff below it. After a bit, we removed that as well, and things didn't fall down. We found the old bar and chain that had been used for hanging cooking pots over the fire. I would have loved to keep that bar and chain, but couldn't see a way of making it fit in with the wood burning stove, or indeed the metal arch, so it had to go. I had to go out in the evening, but work continued without me, and by not very long into the next day, we had the fireplace opened out, the metal arch in place, and a hole in the floor. At about this point, with the back of the fireplace clearly defined, we looked up building regulations for how much space we needed to leave around the stove, so we could measure where the stove and front of the hearth would need to be. The stove only needs to come to the front edge of the fireplace, i.e. the front of it will be in line with the wall, and the nice piece of slate I dug up when making a flower bed is just the right size to go in front of it to make sticking-out part of the hearth. I then asked Ian, who was doing the looking-up, Does it say anything about the thickness of the hearth? Erm, yes. Yes it does. I wished I hadn't asked that question. If the hearth sits on combustible material, e.g. wooden joists, it has to be at least 250 mm thick. That's not far off a foot. We learned this just after I'd made very clear that I wanted the hearth not much thicker than the piece of slate, i.e. a couple of inches at most. Hmph. On the other hand... if the hearth sits on non-combustible material and has an air-gap of at least 50 mm, it only needs to be 125 mm thick. That's much more like it. We certainly have the air-gap, so what to do about those combustible joists? We decided that they could be replaced with angle-iron of hefty dimensions, in fairly large quantities. Finding angle iron wasn't easy. The number of DIY shops is limited round here, and we weren't sure they'd have it anyway. We tried calling the blacksmith, but he didn't answer his phone and we doubted he'd be there on Easter Saturday. 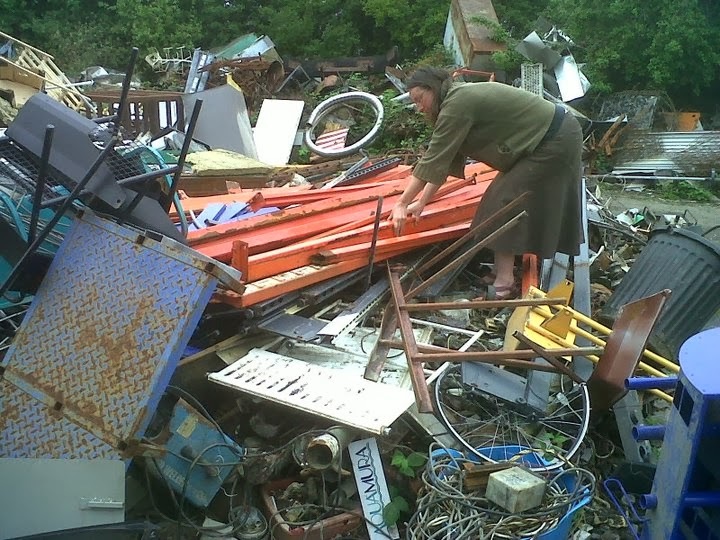 A neighbour mentioned a scrap yard, but didn't know exactly where it was. There was a builder's merchant that was open - even if they didn't have it themselves, they might be able to point us towards the scrappy. This plan worked - we got directions to the scrapyard. We bought three (for £5) and transported them home. These turned out to be even better than angle iron, and matched the joist we were removing very closely. This meant that the whole joist would be replaced, rather than just half of it, so more nails were ground off, and the joist was extracted. Once the supporting beam was in place (which took two attempts because its similarity to the joist distracted us from the fact that it needed to go a couple of inches lower), we needed a concrete base to the hearth. We'd originally planned to make a frame of some kind and pour new concrete into it, but a quick search of the hillside produced a concrete slab that turned out to be exactly the right size. In fact, when we dug it up, we found tiles on the other side, so it had obviously been a hearth at some point in its life. It was one hell of a job shifting into position, but once there, it saved a lot of work (and potential mess) in pouring a new slab. ... to fit in the space behind it. The hearth is now laid, with plenty of mortar under the thinner roofing slates (one of them still isn't quite right - I hope a little more mortar will fix it) and a nice fireplace with space for the stove. There's still some brickwork to do for the arch, but we're leaving that until the stove's in, because the extra access through the gap might be useful. What was Pebble doing while all this was going on? She supervised, of course. I originally thought we'd have the water tank in the loft, allowing the hot water to simply rise from the stove to the tank (thermosyphoning). We then got a plumber to come and quote, and he didn't like the sound of that idea, preferring a tank below and a pump. We didn't like the sound of his quote (though he was a very nice man) and got another plumber in, who was quite happy with the tank in the loft plan, but hasn't yet (and I've lost count of how many weeks it's been) given us the promised quote. Deciding where the tank goes affects which way the pipes head off from the stove, which is something that really should be determined before the very heavy stove is placed an inch or so from a wall, surrounded by other walls.